Observations from the ALMA telescope array has made some interesting observations of carbon monoxide in the vicinity of the star Beta Pictoris. The results have been published recently in Science, and it tells an interesting story about comets and planetary formation. Beta Pictoris is a young star with a protoplanetary disk. It is only about 63 light years away, so it provides us with a good opportunity to study the formation of a solar system. In this new paper, large quantities of carbon monoxide have been observed within the protoplanetary disk. The reason this is interesting is that carbon monoxide is unstable when exposed to sunlight, so any carbon monoxide around Beta Pictoris would typically break down within a century. Since the disk contains large quantities of CO, there must be a replenishing source, and that is likely cometary fragments. Given the quantity of carbon monoxide, it is estimated that you’d need a cometary collision about once every five minutes. That would imply a dense cluster of cometary bodies. An extrapolated top-down view of CO around Beta Pictoris. Credit: ALMA (ESO/NAOJ/NRAO)/W. Dent et al. Further support of this idea comes from the distribution of the carbon monoxide around the star. From our vantage point, the protoplanetary disk of Beta Pictoris is edge on. This can make it difficult to determine the distribution of material within the disk. But since carbon monoxide has a clear line spectrum, the Doppler shift of that spectrum can be used to determine the motion of CO within the disk, and hence its distribution. What we see is at least one dense clump, possibly two, within the disk, as you can see in the figure. Such a concentration is evidence of a planetary body within the disk. 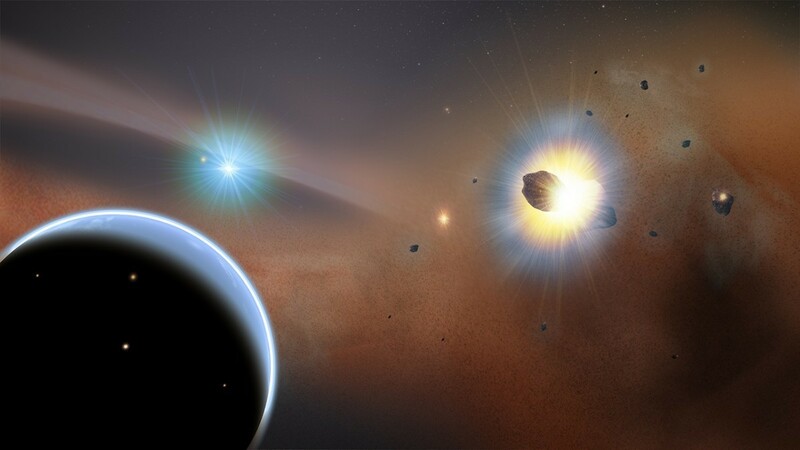 This planet could cause cometary fragments to cluster in the region of the planet, resulting in a high rate of collisions. So it seems that the disk of Beta Pictoris is far more active than originally thought.